Written by	Samantha Fishella-Dench, L.E. Two things that set aestheticians apart from any department store salesperson or direct sales representative are training and use of client education. Yet, many do not use their expertise to their advantage when clients are in the treatment rooms. Perhaps it is the fear of “product pushing” that prevents some from sharing. However, the fact remains that if they are not purchasing products at the spa, clients are turning to brand name department stores for products. 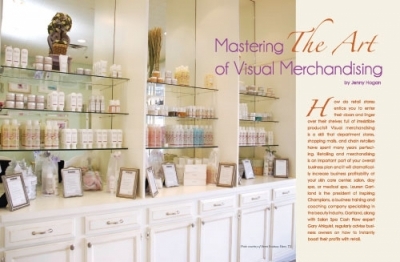 As licensed professionals, aestheticians have the ability to change that thought process in clients by building trust, which happens in two forms: easing clients into products as they need them and educating them to offer value. When meeting with a new client, do a thorough skin evaluation and have him or her bring in all current skin care products being used at home. Listen for skin concerns and make notes during the client consultation. After that, thoroughly look at everything the client uses at home. If his or her current routine is ineffective, educate the client on why certain products do not work for his or her skin. If a product is alright, consider suggesting they use the remainder of the product before spending more money on new products. This is important because, though the client could be sold an entire line after their first facial, the goal is to build trust. Using what they already have to work with at first will help create that trust. Clients are looking for help and guidance, but they also do not want products pushed at them. Finding that delicate balance is key. If it is possible to look at everything they are using and just fill in the gaps, or add in a product that will change their skin, their trust will be earned and they will start purchasing the rest of their skin care products from the spa each time they come in for facials. Is this method as beneficial financially as introducing the client to a whole line of products upfront? Not at first. However, education and building trust will bring financial gains to the spa as the client will, eventually, purchase all of their skin care products from the spa. It is important to educate every client that comes into the treatment room, regardless of whether they are a seasoned or new client. With first-time clients, it is a good idea to explain every single step of the facial. Explain which products are being applied and why. After, explain how the skin functions and how the skin is going to utilize the product based on needs. Another important reason for first-time skin consultations is to find out exactly what each client’s needs are and focus treatments on that. Of course, other issues in the skin may be visible and can be treated, too, but focusing on the client’s specific needs that day will gain trust and leave them happy as they leave the treatment room. With seasoned clients, always ask what specific skin concerns they are having and address them during their facials. Remember to educate them during each step, regardless if they have had that facial before or not. Most clients are too relaxed to remember what they were told four to six ago and will be grateful for the added knowledge provided to them. Education is where aestheticians shine and set themselves apart from sales people or product representatives because those individuals only know how to sell skin care products – they have no educational background or license to back up their claims. Gaining each client’s trust through education is key. Without proper education, clients may end up reading articles online or doing research on products that will not serve their skin correctly. They may also end up wasting money on products that they do not love, or which do not work for their skin. Be the expert – the one with the license and continuing education. Be knowledgeable. Share that with clients, as they are in the treatment room because they trust that they can receive help in looking and feeling beautiful every single day. Samantha Fishella-Dench is a 15-year licensed aesthetician, owner of Skin Deep, author, and speaker. Dench’s passion stems beyond treating the skin to include internal health so she can achieve healthy skin for her clients by finding the root of the problem. Dench loves to educate groups of women and share her knowledge and passion for skin through her book and speaking engagements.